See the Universe with my eyes. NASA finally found 7 habitable planets orbiting a common star, which is 39 light years away from us. 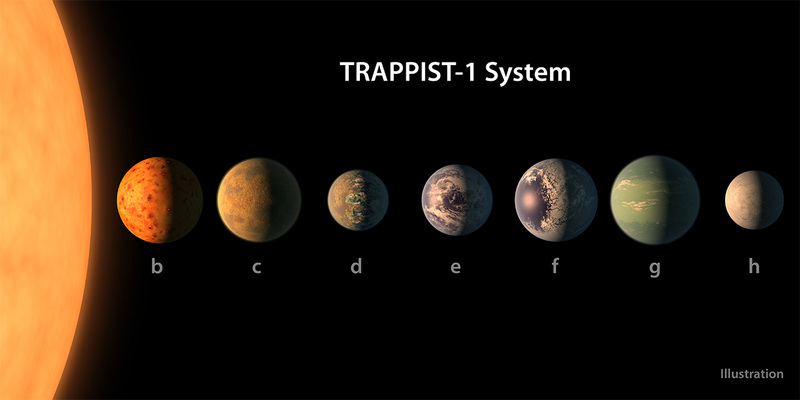 NASA’s Spitzer Space Telescope revealed the system of 7 exoplanets orbiting a star TRAPPIST-1, named after the Transiting Planets and Planetesimals Small Telescope (TRAPPIST) in Chile. In May 2016, researchers using TRAPPIST reported three exoplanets of the system, finally after groundbreaking research and using sophisticated Spitzer telescope, four more planets are found orbiting the star. According to the scientists, 3 out of these 7 planets are in the Goldilocks zone, means their distance from their star is such that it is neither too hot, nor too cold to support liquid water on their surface. The mass and densities of these planets are calculated. Based on the data, all the planets are likely to be rocky. Though the mass of the 7th planet are not yet calculated, but it is thought to be “icy-snowball” like planet. The star that the seven planets are orbiting is called a red dwarf– it’s small, dim, and cool compared to our own sun, but it can burn for a very, very long time– somewhere on the order of a trillion years, or even longer. The discovery sets a record of largest number of habitable planets orbiting a common star.